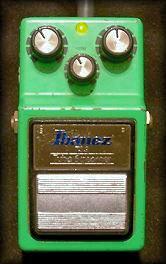 For many of us, when we see a green pedal, we immediately think of an overdrive. And not without reason. The green pedal is one of the most iconic overdrives out there, and it comes in many forms. This article is an attempt att describing the various forms it has taken over the years, from its humble beginnings to present day. 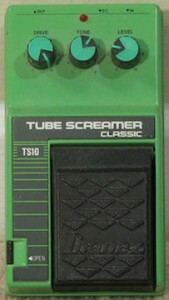 TS-10 Tube Screamer Classic: This one took a while. The ”Master Series” which replaced the ”9” series in 1985, didn’t actually have a Tube Screamer. 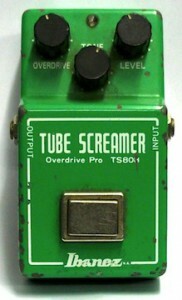 They kept the Super Tube Screamer instead (but moved the mid boost’s position to after the distortion stage) and called it ”Super Tube” (STL), The Master Series only lasted until 1986, when it was replaced by the ”Power Series” – which is when the number ”10” started appearing in the model names. 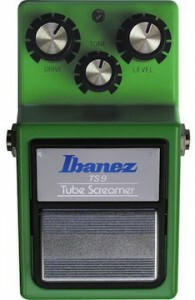 The STL hadn’t been a success, so Ibanez brought out the TS-10 Tube Screamer Classic to please the public. The TS-10 can be had for a lot less than a 9, and will sound close enough, if not just as good. They are harder to mod to 808 specs, though, as the TS-10 not only had component value changes (like the ”9”) but also a few components that weren’t there before. The input/output jacks are mounted directly on the pcb, with no support from the box, and many of them eventually fail. The pots are also mounted directly to the pcb, and while they have a little more support from the box than the jacks, they are definitely a potential weak spot. It’s still a great pedal, though, and not too expensive. 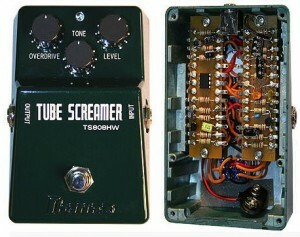 TS-5 Tubescreamer: This one appeared a bit later, when the ”Soundtank” series had been in production for a little while. Once again, Ibanez launched a line of pedals without a Tube Screamer in the lineup. It didn’t last, though, and when the Soundtank series moved to plastic boxes (within the first year or so), the TS-5 was born. It sounds a little darker than the others, but has a good tone of its own. It has the same weak spots as the ”10” – pcb-mounted jacks that just poke out of holes in the enclosure, without support. This one also has its pots mounted the same way as the TS-10, plus the enclosure itself is plastic… Still, there are plenty of them around, so they must be relatively sturdy. 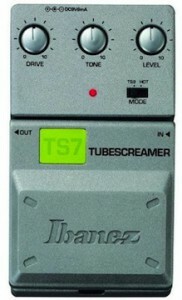 TS-7 Tubescreamer: This is the one with the ”gain” switch and the funky ”pop-up” pots. It’s pretty good, and relatively easy to mod as well. The tricky bit is taking the pedal apart and putting it back together – it’s built using a modular system, with a bunch of different circuit boards connected with wires and multi-connectors. It also has a gain boost switch, which more than doubles the max gain. The early run of ”7” series pedals were famous for having issues with the switch – they sometimes broke, but most times it was a height issue (the footpedal didn’t fully release the switch, so the circuit didn’t register every push as a switch impulse). Current production models are much more reliable, though. All in all, the TS7 – as indeed the whole 7 series – is a good, if slightly underrated pedal. 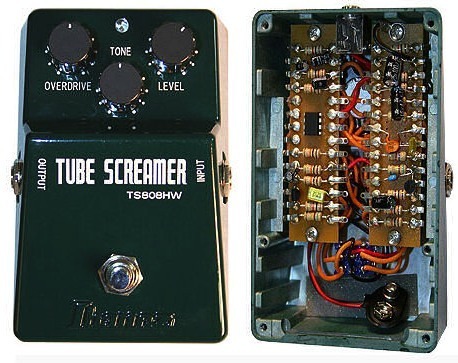 TS-9 Tube Screamer reissue: Released in 1993, it more or less took off where the production was stopped in the ’80s. It was made by Maxon, used the TA75558P op-amp (just like the last batch of originals) and were very difficult to tell apart from the ’80s item. The switch (the little tactile switch inside) is different, though, so if you take it out the difference is clear. The old ones also makes a slight ”ping” sound when the pedal is pressed, while the reissue ones have more of a muted ”click” sound. From 1996 onwards, the pedal got a ”CE” mark on the bottom, which helped identify it as a reissue. In 2002, Ibanez took over the production from Maxon, and from 2006 onwards, the pedal comes with the JRC4558D op-amp (in the EU market – in the US, the old TA75558P lasted until early 2010). 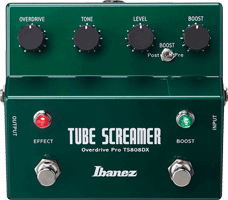 TS-808 Tube Screamer reissue: This is – save for the value of two resistors and the type of adapter jack – the exact same thing as the reissue TS-9, but in the older style box. All of the reissue 808’s have the JRC4558D, and all are ”CE” marked. This is a good-sounding TS, no doubt. But if I wanted an 808, I’d probably just get a ”9” and mod it – it’ll be exactly the same, but much cheaper. And I could use the normal adapter plug… The TS-808 does come in a cooler box, though, and one that allows you to fit a true bypass switch a bit more neatly – rather than drill a hole through the nameplate (as you would do on a TS-9), the switch can be mounted where the stock switch is. But that’s really the only advantage. TS-808HW: A handwired version of the 808. Rather than being built with the circuit board design that’s been around since the late 1970’s, this one is built on two combination terminal strips/circuit boards. They look like the old standoff phenolic boards used in vintage amps, but undoubtedly also have copper traces underneath to handle the connections between components (if you look closely, you’ll see that most of the soldering eyelets aren’t being used, so there must be some other way to connect components to each other). It is ”handwired” in the sense that the components need to be installed by hand, whereas the circuit boards in the TS-9/808/DX are machine-loaded. The wires to/from pots, jacks and switch are equally handwired in all of them, though. The TS-808HW is very expensive, and I haven’t tried it to see if it’s worth the extra cash (or if it is actually true bypass, as advertised). 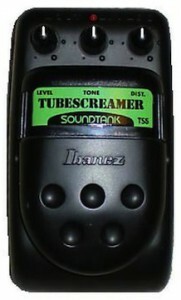 TS-9DX Turbo Tube Screamer: Released in 1998, this is a TS with three added modes. Like the regular TS-9, it was built by Maxon until 2002, and used the TA75558P op-amp until mid 2006, when it started shipping with the JRC4558D (again, 2010 in the US market). The very first batch (back in 1998) had an error in the circuit board that holds the gain pot, preventing it from reaching full gain. It was quickly corrected, though, and over the years I’ve only come across one of those. The TS9 mode sounds exactly like the TS-9, while the other three modes offer increasingly dramatic boosts in bass response and volume, with equal dramatic reductions in the amount of distortion. 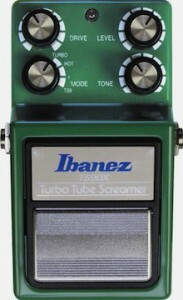 Tube Screamer Mini: In 2015, Ibanez jumped on the mini pedal train, and of course the ubiquitous Tube Screamer needed to be part of that range of pedals. I haven’t tried this one myself, but the reports I hear is that it sounds just fine. I doubt one will make it to my bench, though, since the subminiature components that allow the pedal to be shrunk down to this size does make it quite hard to modify. But if you want a traditional tube screamer sound that doesn’t take up as much room on the pedalboard, it’s definitely worth a try. 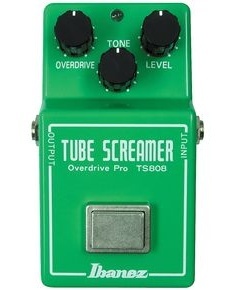 TS-808DX: A Tube Screamer with a boost section that can be placed before or after the overdrive circuit (before if you want more distortion, after if you want to boost the volume). Both circuits can be turned on/off independently, and there’s also a switch on the back to select 9 or 18 volt operation. In the 18 volt setting, the voltage is internally doubled, so don’t feed the pedal more than 9vDC at any time. Among the vintage items, the TS-9 or TS-10 are the ones I’d go for. Finding a TS-808 at a reasonable price is nearly impossible. For a darker, deeper sound, the TS5 is really good – but you do need to take care when using it, as it is more fragile than the others. Among the newer ones, again it’s the TS-9 – it can easily be made into an 808 (or modified in any other way you’d like), but cost far less than the reissue 808. The real sleeper is the TS-9DX – it’s more expensive than the regular TS-9, but its three additional modes makes it more versatile (assuming you actually like what they do).